While thousands of UO students completed their finals and promptly rushed home for the holidays, 15 eager Women in Business (WIB) members opted for a little adventure instead. 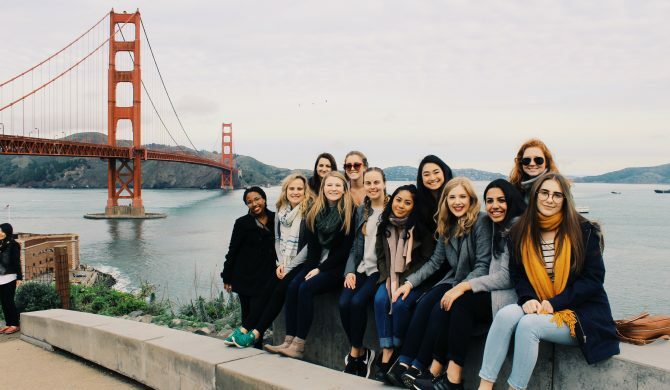 These students packed their bags – with business casual attire, of course – and embarked on an eye-opening journey throughout the Bay Area where they were able to explore a variety career opportunities available to women today. 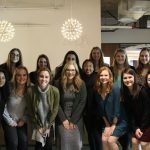 Thanks to LinkedIn, some very supportive UO alumni, and our dedicated executive board the 15 of us were able to participate in employee-run discussion panels and in tours of companies ranging from Pinterest to Google to AKQA and more. 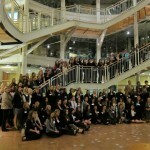 Over the course of five days, we got to connect with women from a variety of careers and educational backgrounds who were more than happy to answer questions and share their wisdom and experiences with us. Our group learned about the myriad of jobs in data analysis, finance, creative directing, risk mitigation, and business management while, at the same time, learning about presentation and negotiation skills that aid in landing those jobs. Hearing dozens of success stories from women who live in one of the most male-centric areas in the U.S. was a very empowering experience. Although Silicon Valley is widely known for under-representing women and for fostering a sexist culture, women continue to push back against the discrimination and bias that persists in the workplace today. The general consensus from the women panelists was that when trying to overcoming gender bias, the most appropriate way to fight back is by working hard, being professional, and knowing your own worth. 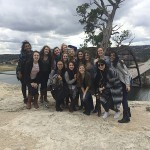 The trip highlighted the necessity for women to encourage and support one another. 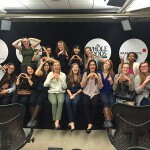 That’s what WIB is all about! After landing in San Jose and getting settled into our hotel the previous night, we resolved to spend our only “free” day exploring the big, bad city of San Francisco. We spent the first part of our day walking along the Golden Gate Bridge, checking out the scenery, and taking an unspeakable amount of pictures. You know, typical tourist stuff. Then we decided to head to Mission Dolores Basilica – the oldest surviving structure in San Francisco – where one of WIB’s very own executive board members, Giselle Andrade, spent her childhood. Our group gained new insight into the history and culture of San Francisco as we took a guided tour of the church and cemetery. After one too many ghost stories, we decided it was time to move on to the next item on the agenda. 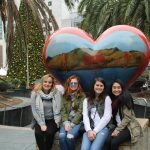 We hopped on BART and headed to Union Station later that afternoon for a little bit of shopping. The plaza was filled with great smells, beautiful architecture, and a swarming crowd of people enjoying themselves. After splitting up for a few hours, our group met back up in front of Macy’s 80 foot tall Christmas tree. 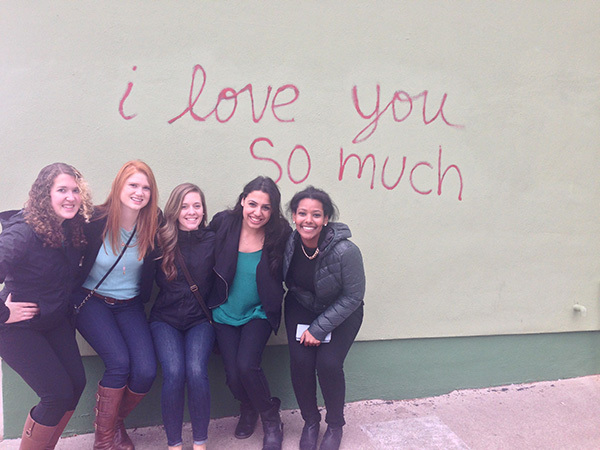 We snapped a few group photos and, with that, concluded our first day of the Bay Area site visit! The first company visit took place at Pinterest’s headquarters in San Francisco. 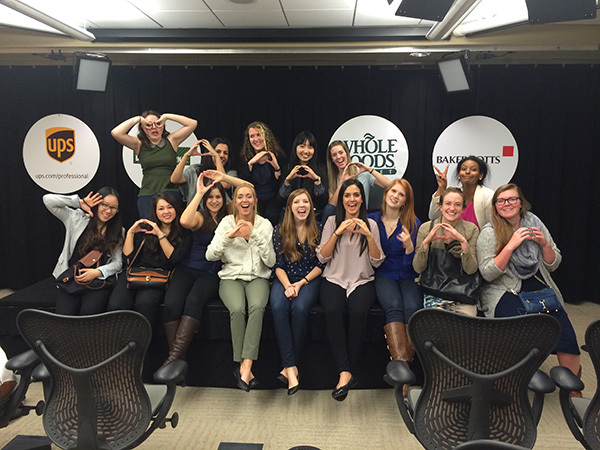 We were invited by UO alumni Amy Gilmer who has been working as a creative strategist for Pinterest for a little under a year. 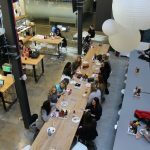 After helping ourselves to a catered breakfast – which is only one of three free meals that employees are provided daily – we sat down with Amy and three of her colleagues to discuss what it’s like to work at Pinterest. 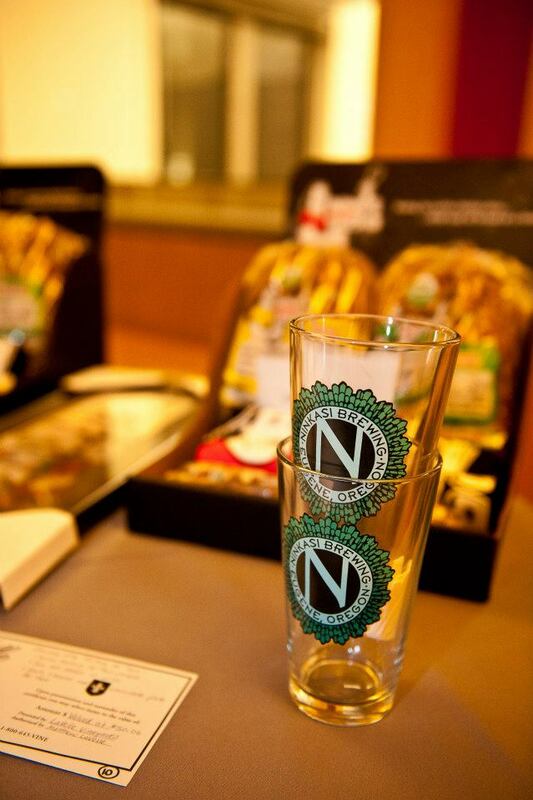 The rapidly growing web and mobile application company values creativity, diversity, innovation, and teamwork. 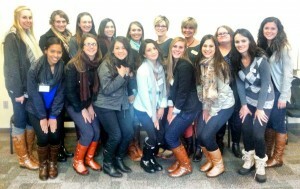 The women unanimously agreed on the staff and company culture being their favorite part of the job. They also mentioned plenty of opportunities for growth within the company as well as opportunities for internal job changes and travel. What’s not to love? Naturally, the next question must be: How exactly does one land a job at Pinterest? 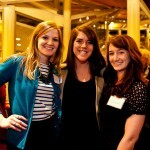 The panelists attributed their career success to the power of networking, relevant work experience, and higher education. All of the women we spoke to had completed either a bachelor’s or master’s degree and all but one had been backed by a recommendation from within the company. After imparting a few more words of wisdom and giving us a quick tour of their beautiful workspace, the kind panelists headed back to work and we set off for our next adventure. After a 15 minute walk, our group arrived at the headquarters of an international ideas innovation company named AKQA. 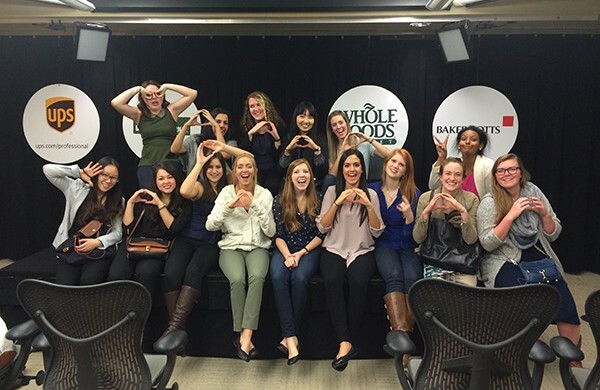 WIB was invited by UO alumni and former WIB member Catlin Bowers who manages a four-person team that works on a variety of projects for different companies and firms. 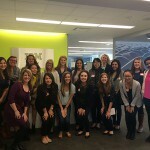 The panel of female employees included a creative director, a contract writer, an experiential data analyst, a design strategist, and a recruiter who all earned their positions through higher education and related experience. These women have worked to create iconic experiences and products for big name brands like Nike, Apple, and Visa. And although the panelists only comprised a tiny fraction of AKQA’s 2,000 employees they managed to give us valuable insight on what it’s like to work for a giant media firm. Our first stop of the day was in Levi’s Plaza which houses the headquarters of multi-billion dollar company Levi Straus & Co. Our group was invited by UO alumni Rosita Rerat who works as a marketing manager in the San Francisco office. On the panel was Rosita and four of her female colleagues who work in a variety of departments from finance, operations, and risk mitigation to creative services and ecommerce. To help us determine if we were interested in a certain career field, they each went in depth about what their individual job entails and then ran through a typical day on the job. 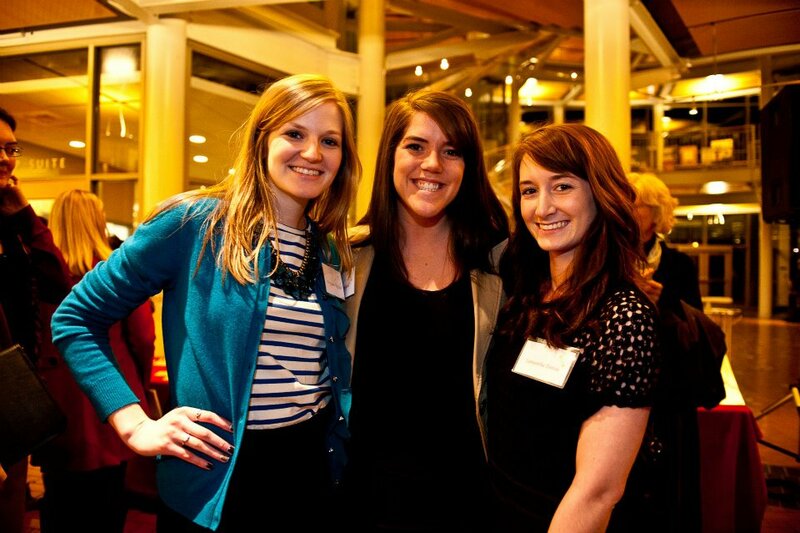 When asked about their favorite part of working at LS&C, the women acknowledged that the positive company culture is a big part of what keeps them around. The company’s values encourage social and environmental responsibility and also promote open access to superiors including their very own CEO! Of course, there are other perks that keeps LS&C’s turnover rate relatively low including the opportunity for growth and development within the company as well as for new experiences through travel. 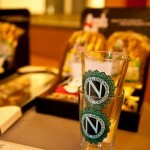 Unfortunately we were not able to tour the corporate office, however the panel discussion had more than made up for it! A short walk later our group reached San Francisco’s Financial District, the city’s main central business district which houses the headquarters of Wells Fargo. We were welcomed by a panel of 5 women who work in Wells Fargo’s financial and managerial departments. The panelists briefly described their responsibilities within the company and then focused the discussion on work life balance and sexism in the workplace. The women were very honest with us, admitting that work isn’t always exciting and there are some days when they aren’t exactly thrilled to come in. But, they said, it’s okay to feel bored with your job sometimes! There is plenty of opportunity for excitement outside of the workplace. In regards to a question about dealing with sexism in a male-dominated environment, the panelists advised us to always be professional, to communicate frequently and clearly, and to work really hard. After wrapping up with the Wells Fargo employees, we visited the Fisherman’s Warf and the Ghirardelli chocolate factory before calling it a night. We were fortunate enough to be able to squeeze in one last company visit before flying back to Eugene. 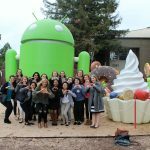 WIB was invited to tour the Googleplex by UO alumni and former WIB member Kelly Weiss who manages a team of software engineers at Google. Kelly gave us a tour of the corporate office and its amenities which included gyms and restaurants that are free to employees. 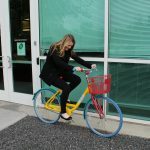 Afterwards, we sat down with Kelly and asked her questions about how she’d landed a job at Google, what she talked about in her interviews, what she majored in at UO, etc. Kelly had worked as a manager at Frito Lay prior to landing a job at Google. 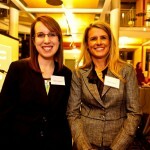 She was fortunate to have a friend within the company because she was offered an interview through the recommendation. During her interview Kelly talked about experiences related to her marketing degree and also about her commitment to WIB as an executive board member. Sure enough, she got a call back a few days later! 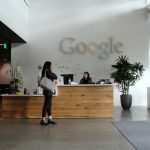 She mentioned that because Google does not pigeonhole their employees by forcing them into a job based solely on their degree, her career took an unanticipated but welcome turn. Instead of working in advertising like she’d imagined, Kelly’s job as a technical channels specialist is to discover software engineer superstars and untapped talent in hard-to-reach places. She absolutely loves her job and is grateful for the opportunity to work for a company that has such a vast and meaningful impact on the world. After spending the afternoon with us, Kelly had to get back to scouting the world for gifted individuals and us WIB girls had a plane to catch. 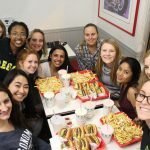 While waiting for departure our group talked about how beneficial this experience had been for us as women preparing ourselves for careers in business. The trip opened our eyes to jobs we’d never heard about and subsequently helped many of us narrow down our career interests. 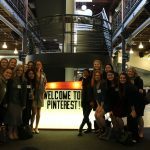 The site visit was also a great networking opportunity for those potentially interested in working for Pinterest, AKQA, Levi’s, Wells Fargo, or Google. One of the company’s even asked for our resumes and two offered internships! I couldn’t have picked a better way to spend my winter break than hanging out with my WIB family! Thanks to everyone for making it such a memorable experience! 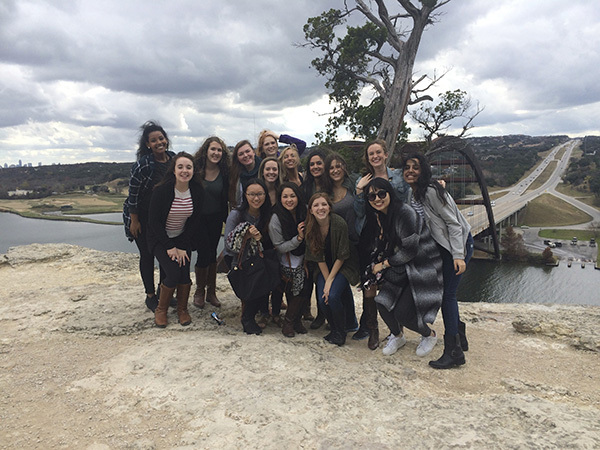 This past winter break, 15 students in the Women in Business club embarked on a journey to Texas to conduct site visits at local companies around the Austin area. I’m going to start out with a confession. Before landing, I had a pretty stereotypical view of what I thought Austin was going to be like. I was expecting ten-gallon hats and ranches everywhere. But after we got the opportunity to explore the first couple of days, it felt like I was home in Portland, with just a few extra y’alls sprinkled in. One stereotype that ended up being real is the southern hospitality. Everywhere we went, people welcomed us warmly. The day we landed was the same night as the Heisman ceremony and when we went to dinner, different people kept congratulating us on the success of the team and seemed just as excited as we were to hear the announcement. This was a scenario that continued throughout the whole week, everywhere we went, and put into focus that the University of Oregon is not only a school, but a national brand on the rise. Our site visits started off with IBM, where we got a tour of the design center, a place where recent innovations like the Watson supercomputer have been created. 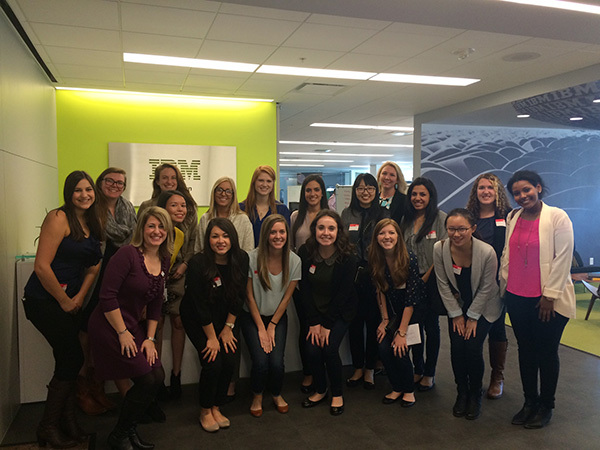 Along with the tour we got to talk with three different women in the company during a “speed mentoring” session. During that session the piece of advice that stuck with me the most was to find three times in your life where you felt on top of the world. Then look at those moments and see what trend appears within these moments. Use these characteristics in your reflection for future career paths. 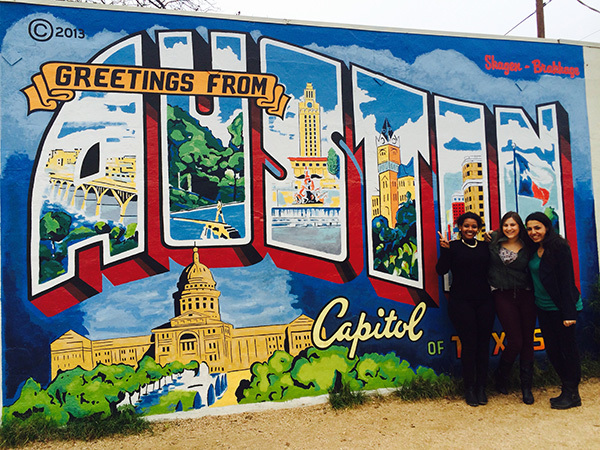 The whole week, when we visited other companies like Dell or GSD&M, we realized how important company culture is. In your lifetime, you will spend more time in the workplace than with your actual family, so why waste your time in a place that doesn’t inspire you to be there? Each company showed that, with the combination of initiative and passion, you could be successful in whatever career path you are after. But really the best part of the trip was going through all of this with my fellow club members. I knew very little of the women before going and by the end of the week I was so inspired in different ways by all of them. 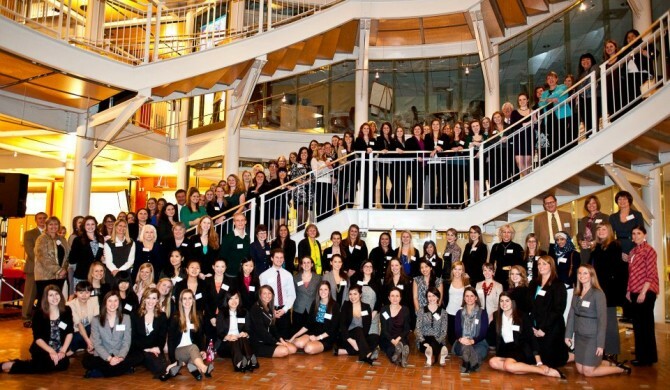 If you’re looking to get involved, Women in Business meet on Tuesdays at 6pm in Lillis 245. No matter what your interests are in the Lundquist College of Business, take the time be active in any of the clubs, you won’t regret it. 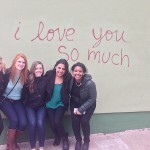 Sahar Petri is a sophomore from Portland studying Business Administration and Media Studies. 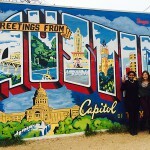 Sahar is currently interning for O Heroes and hopes to work in community relations when she graduates in 2017. This past weekend members of the Women in Business club headed to beautiful Central Oregon to learn about the business environment and various industries there. We visited Mt. 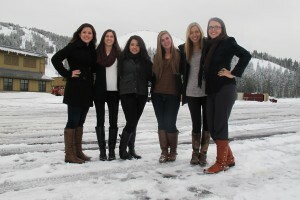 Bachelor, Deschutes Brewery, and Sunriver Resort and found that amidst the snow and mountains there are a tremendous amount of employment opportunities. 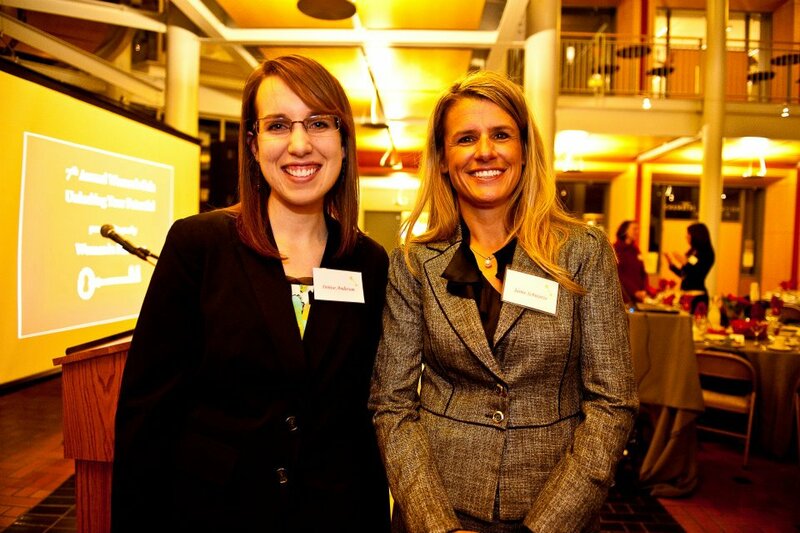 Devon Scanlon from Sunriver Resort spoke about believing in the “power of women” and their ability to “change the world through confidence and persistence.” We found that in a male-dominated field, women are becoming stories of success. Hearing from the hospitality and tourism business, along with the food and beverage industry, and many other areas of business, we gained new insights that will help us in our future endeavors. Ultimately, it comes down to “determination and having a voice that will make you stand out” stated Scanlon. 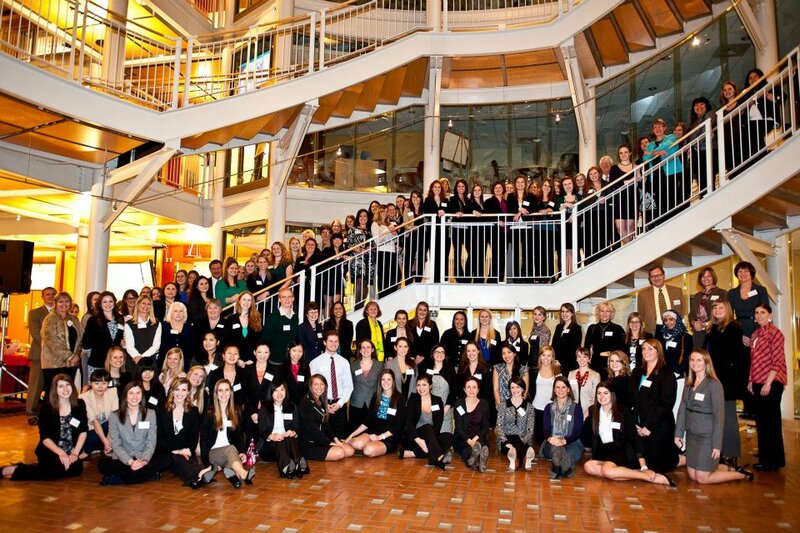 It was a wonderful weekend for WIB, and we look forward to many more! My name is Kelly Weiss. I am a Business Administration Major with a concentration in Marketing and a Minor in Communications. I am expected to graduate Spring 2013. I am from Seattle, WA and love the Pacific Northwest and my ducks! 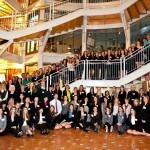 In February of each year, the Lillis atrium fills with successful business professionals and enthusiastic students. 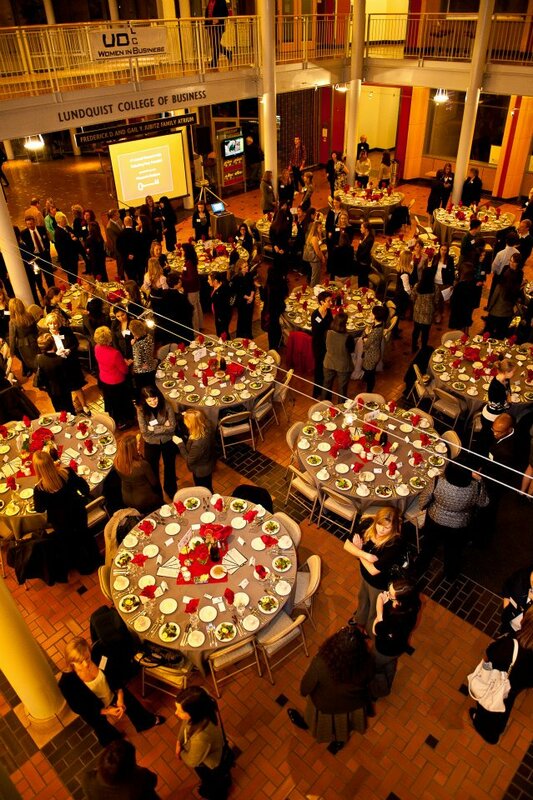 They gather to celebrate women who are living out their careers in the world of business. 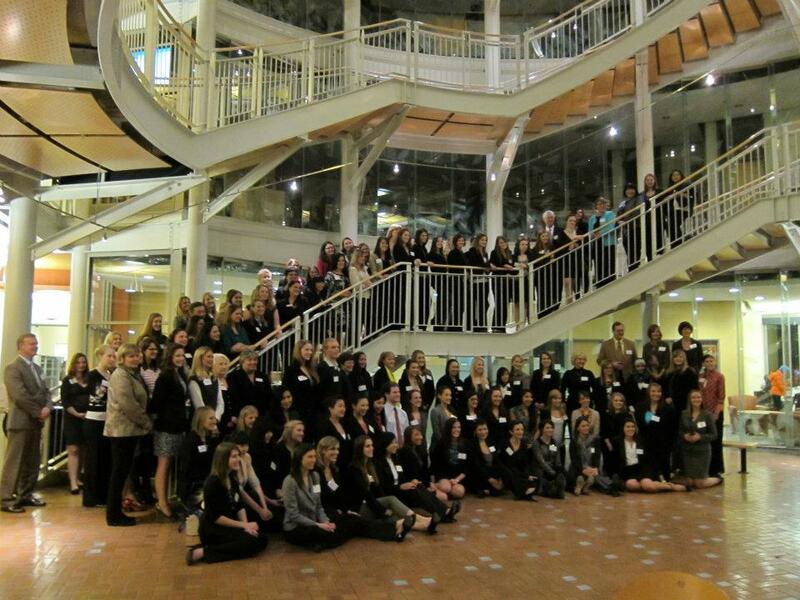 This year’s seventh annual Women in Business (WIB) Gala, once again, brought a night of networking, mentorship, and fun to the Lundquist College of Business. 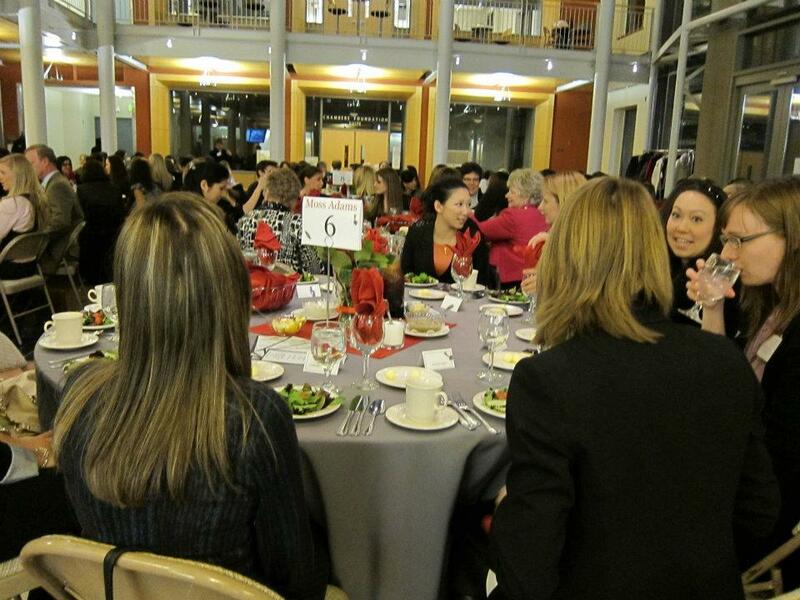 The event started off with a welcome from Kelly DeFacci, president of the Women in Business Club. Dean Kees de Kluvver soon followed. In spirit of the event’s theme, “Unlocking your Potential,” the dean recalled a story I was delighted to hear: the story of Dr. Mae Jemison, the first African American woman to go into space. When I was in grade school I read Dr. Jemison’s autobiography and have looked to her as a role model ever since. This woman is a go-getter from the core and is determined to accomplish anything she sets her mind to. What a great message to open the night! 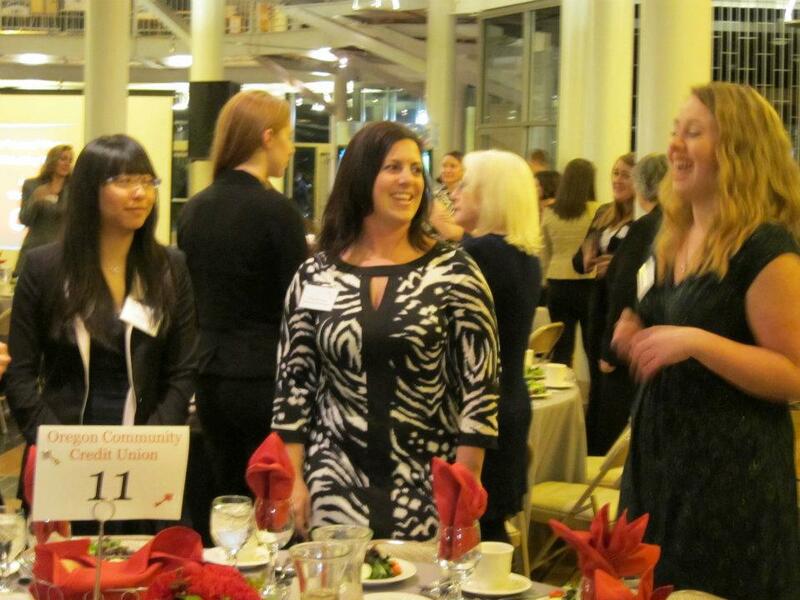 I had the pleasure of sitting at the table sponsored by Fred Meyer, the platinum sponsors of this year’s Gala. 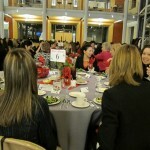 Sharing my table was a mix of Fred Meyer professionals, women in leadership roles here at the business school, and students. 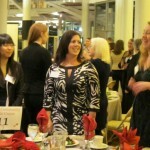 Kelley Bloom–a Key Bank vice president and district leader of the company’s Key4Women program–delivered the keynote speech. 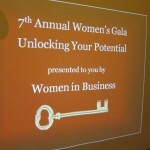 Bloom surprised me when she began to talk about the top five mistakes that women business owners make. I expected her to say “all is well” and “women rock,” but she wasn’t afraid to discuss the unique advantages and challenges women face in the business world. 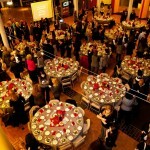 This was my second year at the gala. 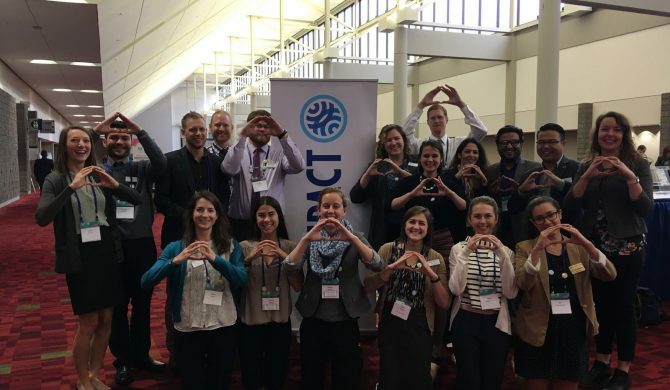 Each time I’ve attended it, I’ve had a chance to consider what influences me, the opportunity to connect with meaningful mentors, and it has motivated me to dream about my future. When I look around the room and see it filled with established women professionals, I wonder what marvelous things I will be able to accomplish and what story I will tell when am in their seat years from now. 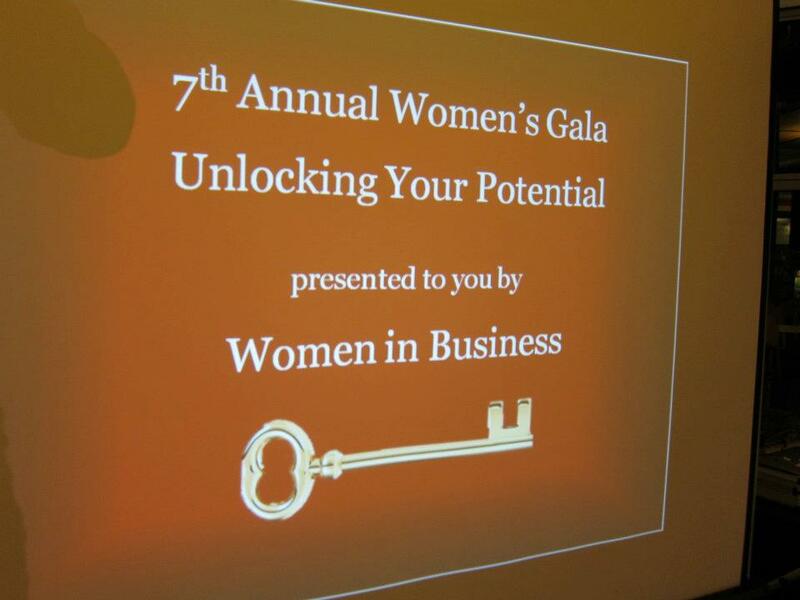 I really appreciate having the opportunity to attend the Gala, so I would like to give a special thank you to all the companies who sponsored the event and to members of the Women in Business club for making it happen.